Your $25 will pay for food. Maximillion thanks you! Max is a funny boy. Just look at him. Can you see the wheels turning? Or have they stopped??? Max is about a year old and a huge goof. He is likely to top out at about 75 pounds after another year of groceries and growth. He's very friendly with people but he has a very short attention span. Yes, he is a goof! While he is good with other dogs, he is clueless as to his size and rough play. Max met test kitty and his sister Emmie. Max approached them on the bed. He eagerly approached them, sniffed them real good, then jumped up on the bed to nudge and smell them more. He was interested, but he was very appropriate with the kitties. We are saying he is good with indoor cats. Although untrained, Max has nice manners and doesn't jump up on people. He sleeps in a crate at night. He really enjoys playing outside and he really enjoys playmates. Max comes to us from the wonderful German Shepherd Miracle Network, who works with a select few Rescue organizations around the country. This is a group of awesome worker-bees and supporters who save one dog at a time from southern CA shelters. 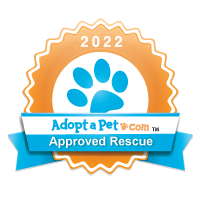 The worker-bees identify special dogs in shelters, temperament test them per the Rescue's criteria and report back to the Rescue organization. Once all the planning is done, the Miracle Group announces the new dog, the supporters start wagging their tails and pledge to save the dog's life. The worker-bees ensure all medical is done for each dog, the dogs are placed in caring boarding facilities, and then a transport team delivers each dog to the Rescue group. That's when we get to tell you about our new dog! Let's give a big warm 'THANK YOU" to Miracle for all the work they did to save Max!